I’m not really sure why I’m making this wish list seeing as I just had my birthday so was given lots of lovely new goodies to play with. But since I am on a self imposed spending ban I thought I would have a little fun window shopping. These are the bits I would be picking up for myself as we move into autumn if money were no object. ASOS Navy Cashmere Jumper, I feel like I navy is going to be my colour for a/w 14 and I love nothing more than snuggling up in a big cashmere jumper, this would look amazing with back skinnies and leather jacket combo or thrown over a summer dress to bring into the new season. Estee Lauder Advanced Night Repair, I used this all up a few winters ago and my skin LOVED it. I hear they have re-formulated and made it even better so I think this might actually be slipping into my boots basket next time I’m popping in for toothpaste. Theodora Warre Ruby Corundum Triple Band Ring, Because I need to fill that jewellery box up with something right? Celine Trio Bag in Red, OK now we are really getting into fantasy land! But just imagine how chic this pop of red would look next to all the navy I’m gonna be wearing. ASOS Floral Cardigan with Kimono Sleves, A fantastic transitional piece to wear over tees and jeans to jazz them up a bit. Do any of these bits grab your fancy? 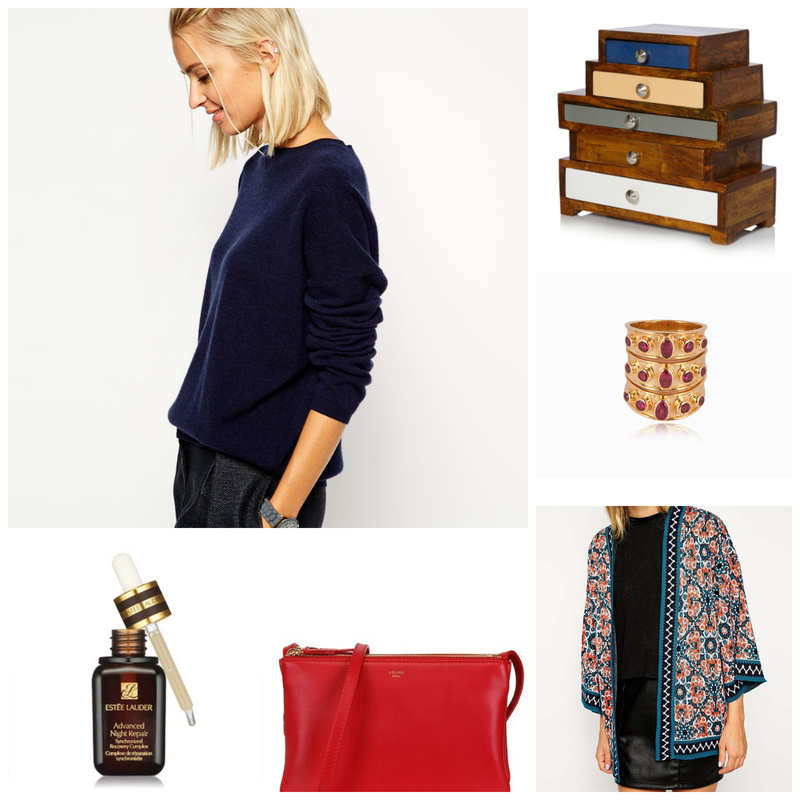 What’s on your wishlist at the mo? This entry was posted in The Fashion, The Wishlist and tagged asos, celine, estee lauder, oliver bonas, theodora warre. Bookmark the permalink. I love ASOS but it so expensive. I think at this point top shop is more affordable for me. Btw how do you british stand your super expensive clothing prices????? Like its insane! Stop by my blog when you have time! Also check out my amazing giveaway! I love the look of the Estee Lauder serum- I am dying to try it!